The past week or so, my class and I have been working on planning the fore-edge painting exhibit of the Knott Collection. Everyone has a lot of ideas and different focuses and today I am going to consider potential themes for the exhibit and how the books would work with these themes. Some ideas we had discussed as a class for themes include: a chronological look at fore-edge paintings or a more general history of them, a focus on England as the origin of these books, a consideration of the variety of fore-edge paintings, landscapes, how these paintings make common books more valuable, residences and cityscapes, nature, and miscellaneous fore-edge paintings. When I made my first installation proposal, I included some of these themes but mostly, these ideas have been a group effort. One theme that many of my classmates came up with was the idea of focusing on Common Prayer books and how fore-edge paintings make them uncommon or more valuable. One of the books I chose falls into this category. Titled Manual of Devout Prayer (Knott_99) this 1771 Catholic prayer book was published in London and printed in Rome – as designated on its inside cover. This is a very basic book. It includes prayers and saints’ feast days as well as a Catholic Calendar. There is nothing about it that would make it especially valuable besides its age and condition. However, the fore-edge is painted with a scene depicting the Battle of Culloden, which occurred in 1746. This battle between the Jacobites and the English forces and the Jacobites consequential loss is well-known in history for being the turning point in harsher measures against aspects of Scottish culture. Initially, I thought that somehow the contents of the book must be in some way related to the scene. 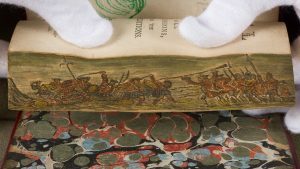 However, it became apparent that the fore-edge painting was simply there to add value as there is no real connection to the content of the book and the battle itself besides the fact that the book and Scots are generally Catholic. This is an instance where someone during the book’s long history saw it and decided that in order to make it more valuable, it would make sense to add a fore-edge painting. Manual of Devout Prayer (Knott_099) depicting the Battle of Culloden. Published in London by T. Meighan, 1771. Themes of England or Cityscapes also were proposed. Another book I am researching falls into both these categories. The Lady of the Lake by Walter Scott (Knott_31) has a fore-edge depicting George St. in Edinburgh along with people, dogs, and carriages. The victorian scene is very pretty and shows how although landscapes or landscapes featuring castles or homes, are very common for fore-edges, cityscapes are also a conducive theme for fore-edge paintings. This fore-edge also is a great example to show how these paintings can be categorized in a variety of ways. It is up to the curators and designers to choose the context in which the book would be displayed as the presentation of the item would change perception. If displayed as a part of England or fore-edge history, the painting takes on a larger meaning. If displayed in relation to cityscapes, the focus would fall on this theme in the history of art. The Lady of the Lake (Knott 31). 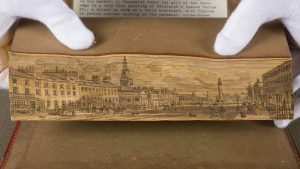 Fore-edge depicts George St, in Edinburgh, Scotland. The book is by Walter Scott, published in London byJohn Sharpe in in 1811. © 2019 Notes from the Fore-Edge: . Museum Core is proudly powered by WordPress.